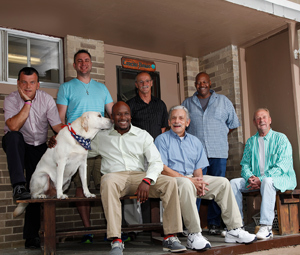 “These men are the heart and soul of Crozier House.” David Mulrooney should know, reflecting at the time of his retirement on his staff’s journey during his thirty-five years as Crozier’s counselor and then as its Administrator. Each of David’s staff members initially came to Crozier addicted to drugs or alcohol, having self-doubt, experiencing despair and feeling desperate. Yet today, they celebrate over 100 years of sobriety among themselves. Some- where along that journey each person discovered a seed of hope that was planted by David and others who have gone before him.